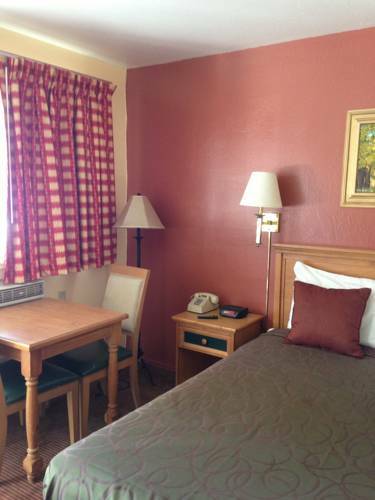 Set amidst the Sierra Nevada Mountains in a superb area for winter snowboarding and summer hiking, the Budget Inn Hotel South Lake Tahoe, California offers visitors a great experience. Only 1.5 miles from the Nevada stateline, the acclaimed casinos Harrahs, Horizon, and Caesars will tempt you with great entertainment and dining options. South Lake Tahoe itself offers endless activities, including the Heavenly Ski Resort with its scenic gondolas affording fantastic views of the lake and mountains, and all easily accessible from this this economy hotel. Guests of the pet friendly Budget Inn South Lake Tahoe will enjoy a complimentary continental breakfast, seasonal outdoor pool, guest laundry facilities, and plenty of free parking. All newly remodeled guest rooms feature free wireless high speed internet access, microwave, mini fridge, hair dryer, free local calls, coffee maker, alarm clock radio, iron and board, cable TV and air conditioning. All pets are welcome at a $20 fee per pet, per night. Notice: The swimming pool and hot tub are currently closed for repairs. There is an extra $20 charge per person for each guest after two people.